Owning a business can be one of the loneliest jobs in the world. You may have a team that you’ve built with your company, but when the big decisions have to be made, it usually falls solely on the shoulders of the business owner. You may get advice from employees, family members, and paid advisors such as your legal team, accountant, or bankers. These people are a great support to your business, but are often too close to offer a differing perspective. Autonomy is important, but so is getting advice from people who understand exactly what you’re going through. This is why it’s so important to have a peer advisory board–a group of people with an outside perspective. They are there to challenge your perceptions of your business and provide the objectivity you may be missing. They’re not a group of people who will tell you how to run your business. They will, however, offer wisdom and perspective to help guide you toward better problem-solving and decision-making. A high performing board is made up of leaders who experience joy in giving back and feel honored to help and contribute ideas and solutions to another business. When you’re in the thick of day to day planning and operations, it can be hard to think long term. An advisory board can help you shift your thinking from the short term to the long term. 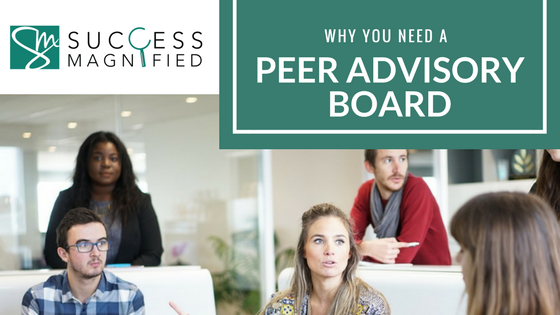 Regularly scheduled peer advisory board meetings pull you out of your daily schedule. It takes the blinders off so you can spend time focusing on your plan for the future. When you make a commitment to yourself to work on a project, it is easy to let it slide into “tomorrow’s” to-do list which can end up being next year’s to do list! When you make a commitment to a group of peers who are there to support you and will ask you to report progress, things get done! Every business has blind spots or trends that they are not seeing. Effective board members have nothing to lose by being honest with you. They can give you the tough love advice you and your business need. A peer advisory board can help you turn the corner, while preparing you for what’s around the corner. An outside board gives you access to talent, experience, expertise, and lessons learned you wouldn’t otherwise have access to. They can help you focus on the future, the direction, and positioning of your company to make better business decisions. Being a business owner may feel lonely at times, but you don’t have to go it alone. You can set yourself up for continued success by surrounding yourself with a peer advisory board to help keep things in perspective. If this idea intrigues you, please contact Mary@successmagnified to learn about her Peer Advisory Boards for Entrepreneurs.